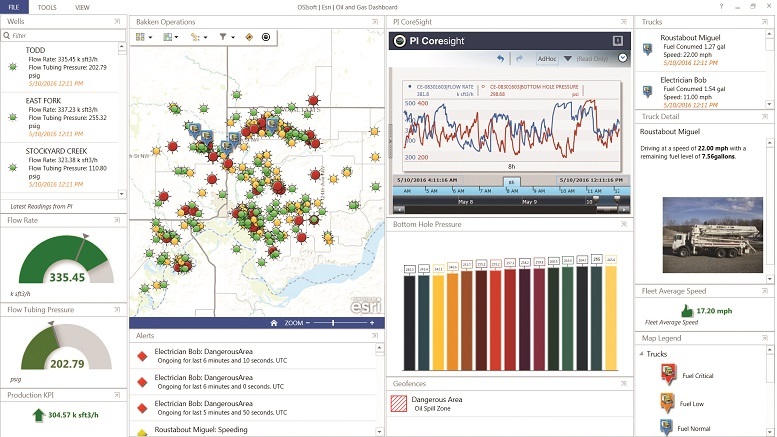 This year at the Esri UC Oil and Gas Space sat down for a hand on experience with OSIsoft to learn more about how they are using GIS in their technology offerings in the Energy industry. OSIsoft is a privately held firm founded in 1980 and operating in over 125 countries worldwide based out of California. They employ over 1,200 employees around the globe deploying their PI (Process Information) Systems to major operating companies like Chevron, Saudia Aramaco, Exxon, and Valero. The PI software is a multi-platform tool set for managing pipeline and business data for equipment in the field. You can dynamically see control data such as SCADA systems through their technologies of the PI Server, PI System Tools, and PI Systems Connections while sharing data throughout your organization and other ERP systems such as Oracle, SAP, and BI. The interface consists of a configurable GUI comprised of customized tables and infrastructure provided by the client. It has some rich tools designed for visualization of field assets inside the office and modeling the flow upstream through downstream of production and distribution. On the back end in the office engineers can create displays of real life systems and tie the SCADA information real time and on the fly in their Process Book application. Moving forward into the future they hope to gain more partnerships with Hadoop technology and companies like Microsoft and manufacturers like Dell and Cisco to link or embed IoT (internet of things) for connected services handling predictive maintenance. OSIsoft PI platform flows directly into existing management systems to handle the complexity and often tremendous amounts of data associate with just one site and will allow for data entry by the front end users. PI can also be taken out of your GIS systems using HTML5 for those who don’t necessarily need every part of data associated with a particular site. Each system is programmed for the different infrastructure each client has in place, creating widgets and applications that are connected to your GIS data and BI systems for distribution on SAP, ESRI and CoreSight. The tools and applications offered by OSIsoft are a dynamically driven rich data visualization tool set that can leverage all types of data across an organization. IoT will be a critical part of information data collection and capture moving into the future. You can learn more at these technologies at http://www.osisoft.com/. 1 Comment on "OSIsoft on Energy"